In 1887 the then Rector of Eyam, the Rev. Egbert Hacking, acquired a wooden armchair that had belonged to Rev. William Mompesson. 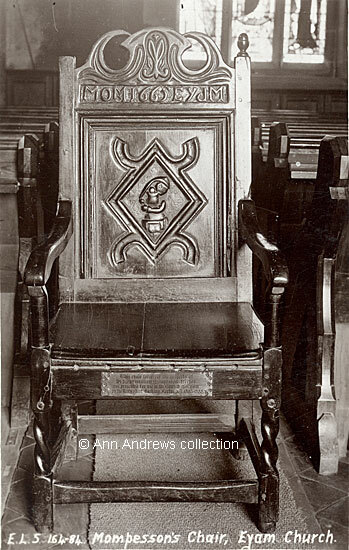 Mompesson had played a prominent part in stopping the plague of 1665-6 from spreading into the surrounding area and this chair, of carved oak, bears his initials at the top of the solid back. The letters "M. O. M" were carved in a horizontal panel, together with the year 1665 and the name of the village of Eyam. Below this is a fairly crude carving of what is assumed to be a Virgin and child. According to the local paper it had been bought by Rev. Hacking's brother who subsequently gave it to the Rector. The chair had been purchased from Elijah Womack of Bolton and apparently had been in the Womack family for over 50 years before it was returned to Eyam. It was said to have been bought by Mr. Womack's father from a man called Needham who lived in Rotherham. It seems to be a mixture of styles with the main part of the chair probably Jacobean whereas the bottom of the chair could be of more recent date - possibly Carolean. by the Revd. Egbert Hacking. Rector. A.D. 1885-1888." Derbyshire's Parishes, 1811, Parishes E-G, which has more about the village. "Mompesson's Chair, Eyam Church". Published by E. L. S. (Edgar Leonard Scrivens), No.164-84. Unused. "Derbyshire Times", 24 September 1887.